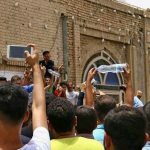 Protest in Khorramshahr over the unprecedented water shortage in the city due to regime mismanagement. The water in Khorramshahr is salty and mixed with sewage. Worse, there’s not enough of it to go around. 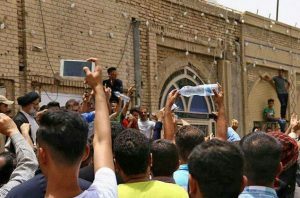 At the beginning of this summer, the people of Khorramshahr took to the streets to protest this critical situation, and they continued to do so for several days until the regime claimed it was taking action to solve the water issues in Abadan and Khorramshahr. Ten people were arrested, 25 were charged with “calling people to sedition” and “abusing popular demands,” the regime pronounced the problem solved and moved on. The problems were not solved, and the problems in Khuzestan Province could not be easily fixed. For one thing, the problems in Khuzestan Province are not new. The IRGC and other agencies of the regime have been stealing water from the province for over 30 years. Second, the problem is not limited to Khuzestan. Water shortages are occurring in areas across Iran, with similar protests taking place regularly. There is no easy or temporary fix to the water crisis in Iran. Sa’adat explained that the water shortage, which caused the water to be cut off for ten days during severe heat, was due to the illegal use of thirty high-power pumps in the neighboring city of Kazeroon being used to irrigate regime-affiliated orchards late at night. Though an official verdict has been issued for the pumps to be dismantled, the governor of Kazeroon has yet to comply with the ruling. Water shortages have occurred, and continue to occur across Iran with alarming frequency, with large protests by farmers in Isfahan early this year over a lack of access to water for agriculture, as well as protests against unsafe drinking water in cities across Iran. In some regions of the Khorasan and Yazd provinces, villages have no access to drinking water. Sistan Baluchistan, Boushehr, Kermanshah, and other provinces also face serious water shortages. Iran hasn’t always had this problem. Where is the water going? The short answer is that it is being stolen by the regime. The water of Zayanderud is being directed to industrial units belonging to the Revolutionary Guards. It would appear that this water is being used for the regime’s nuclear sites. Iran’s drinking water supplies are being sold to neighboring countries, such as Iraq and Kuwait. The people of Iran are left in need. And of course, as seen in the protests in Borazjan, those who are affiliated with the regime may use water as they please, in defiance of the law, even as residents of an entire city go without water for well over a week. There are two sets of rules: one for the regime and its associates and one for the people it oppresses. The solution to Iran’s water problem is to end the mismanagement of the country’s water resources. The regime plunders Iran’s precious water for its endless nuclear pursuits and its financial interests, and the people of Iran never see any benefit. The people see water shortages and violent suppression of any dissent to the regime’s corruption and incompetence. The regime is incapable of reform. The only solution is regime change. The people have begun to rise up and demand a new leadership, one which values freedom and democracy, one with a plan for stability and prosperity for Iran.